Ofitika Pontic (OP): Greek dialect of AsiaMinor which belongs to the Pontic dialect group and is spoken in Greece and in Turkey. ■ Greece: After the Greek-Turkish population exchange in the late1920s and afterward, it is spoken by refugees of the Ophis/Of area who settledin Nea Trapezounta (Pieria, North Greece) and a few other areas such as inParanesti Dramas and in Thessaloniki. In Asia Minor, it was spoken in thevillages of Chaldi, Zourel, Kurits, Krinita, Kofkia, Giga, Zisino and Lekka. Itis closer to the variety of Sourmena than to other Pontic varieties. OP has shriveled underthe unfriendly to all dialectal varieties policy followed by the Greek stateand the Greek education system which first imposed the use of a purist form ofGreek (katharevousa) and much later promoted the use demotic Greek (dhemotiki).All Pontic varieties, including OP, were pervasively influenced by demoticGreek and progressively formed an amalgamated form of Pontic, called KoinePontic (koini pontiaki). OP is preserved in a few isolated pockets inthe provinceof Macedonia(Northern Greece)where is it primarily spoken by older generation speakers. ■ Turkey(Pontus):It is spoken in thirty or so villages in the provinces of Ophis and Qaykara(Mackridge 1995: 153, 1999: 101). Since the nineteenth century, most speakersin these areas were bilingual (OP and Turkish). It is reported that the OPspoken in Pontus has beeneroded by Turkish (Mackridge 1999: 102). Population numbers approximately 553 peopleliving in the village. Number of speakers is 99% of village population. Inurban areas, it is hardly spoken anymore. In total, we estimate perhaps 20speakers of varying fluency. html) at the 2000 EastNusantara Linguistics Workshop organized by the Research School of Pacificand Asian Studies, Australian National University, in Canberra (21-23 July2000). 1 We wish to thank Mr. Ioannis Megalopoulosfor his help in various points of this research. Turkish: A few OP people are bilingual (OP -Turkish). Although they avoid the use of Turkish in everyday communication,they use it as a 'code' language when the interlocutors do not wish to disclosethe content of their conversation to third parties. Older Ophis Pontic people (age range: 70+)tend to be more fluent in OP than in SG. Other generations (age range 50-70 and 35-50)are increasingly monolingual in SG but they are also familiar with KP. Young OP people (age range 20-35) aremonolingual in SG although they seem to have a passive knowledge of KP and/orOP. Most Ophis Pontic people dwelling in NeaTrapezounta still live quiet lives as tobacco farmers. For the past decade,young children have to transport to neighboring villages for their educationwhere they come in contact with peers of different dialectal background (otherPontic varieties, Aromounian, Northern Greek and of course Standard Greek).Most travel is restricted to Katerini, the capital city of the prefecture, andother neighboring areas. The distance of the village to Katerini isapproximately 15 km. Travel to Thessaloniki,the biggest city of Northern Greece, is also regular in the past few years. Historically, OphisPontic people married people of their own ethnic line, but village andethnolinguistic group exogamy has dramatically increased since they settled in Greece. 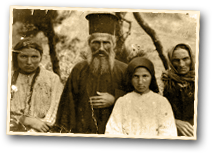 Ophis Pontic peopleliving in Greece areChristian. The ones dwelling in Turkey areMuslims. A few scattered pieces of information onOfitika Pontic can be found in several Pontic grammars such as Papadopoulos(1955) and Oikonomides (1958). The researcher Ioannis Parcharidis visited theOphis area in 1876 and provided a detailed description of the local dialect toM. Deffner. On the basis of this material, several publications on OP were madepossible: Deffner (1878, 1880), Parcharidis (1888) and Mackridge (1987).Mackridge (1995, 1999) provides short, yet meticulous reviews of the researchon OP spoken in Pontus.Asan (1996, 1998) is an invaluable source for the language and culture of theOphis area although linguistically not always a reliable one (Mackridge 1999:101). Under the auspices of the cultural society "AlexandrasYpsilantis" (Nea Trapezounta, Pieria), Dr. Anthi Revithiadou (Universityof the Aegean) and Dr. Vassilios Spyropoulos (University of theAegean) andtheir team started in May 2003 a research project forthe collection and analysis of spoken data of OPspoken in the village of Nea Trapezounta.The linguistic material was gathered during several fieldwork trips in the areafrom May 2003 till September 2006 and was organized into a corpus. The data arebased on the speech of 2 monolingual speakers of Ofitika Pontic and 14 speakerswho use their dialect in everyday communication but, nevertheless, have anactive knowledge of KP and SG as well. The researcher Maria-Anna Tiliopoulou iscurrently writing a PhD Thesis on the phonological and morpho-syntacticstructure of OP clitics. The projectis expected to be completed in January 2008. ■Weak pronominal forms are enclitics. Thefollowing examples are drawn from Tiliopoulou and Revithiadou's corpus ofOfitika Pontic. Note: e-epenthesis and final stress in some enclitics, e.g. (9b-c) usually develops when the verb+clitic construction is in phrase finalposition. Asan, O. 1998. O Πολιτισμός του Πόντου [Thecivilization of Pontus]. Επιμέλειακαι μετάφραση από την Τουρκική, Σ. Ιωαννίδου και Χ. Παπαδοπούλου. Θεσσαλονίκη: Εκδοτικός Οίκος Αδελφών Κυριακίδη. Mackridge, P. 1987. Greek-speaking Moslems ofnorth-east Turkey:Prolegomena to a study of the Ophitic sub-dialect of Pontic. Byzantine andModern Greek Studies 11, 115-137. Mackridge, P. 1995. Τα ποντιακάστη σημερινή Τουρκία: Αρχαία στοιχεία στο ιδίωμα του Όφη [Pontic incontemporary Turkey: Ancientfeatures in the dialect of Ophis]. Αρχείον Πόντου 46,133-161. Mackridge, P. 1999. The Greek spoken in theregion of Pontus. In DialectEnclaves of the Greek Language.Athens: Centre for the Greek language, 25-30(Greek text), 101-105 (English text). Deffner, M. 1878. Die Infinitive in denpontischen Dialekten und die zusammengesetzten Zeiten im Neugriechischen. Monatsberichteden Koniglich Preussischen Akademie de Wissenschaften zu Berlin. Aus dem Jahre 1877, 191-230. Berlin. Deffner, M. 1880. Glossar des ofitischenDialectes. Archiv fur mittel- und neugriechische Philologie. BandI, Heft1-2. Oikonomides, D. I.1958. Γραμματική της Ελληνικής Διαλέκτου του Πόντου [Grammarof the Greek dialect of Pontus.] Λεξικογραφικόν Δελτίον.Παράρτημα Ι. Αθήναι: Ακαδημία Αθηνών. Papadopoulos, A.A. 1955. ΙστορικήΓραμματική της Ποντικής Διαλέκτου. [Historical Grammar of the PonticDialect.] Επιτροπή Ποντιακών Μελετών, Περιοδικού "Αρχείον Πόντου".Παράρτημα 1. Αθήναι. Parcharidis,I. 1888. Συλλογή ζώντων μνημείων της αρχαίας ελληνικής γλώσσας εν Όφει. [Collection of living documents of the Ancient Greek language in Ophis (Greek).] Ο ενΚωνσταντινουπόλει Ελληνικός Φιλολογικός Σύλλογος 18(1883-4), 120-178.